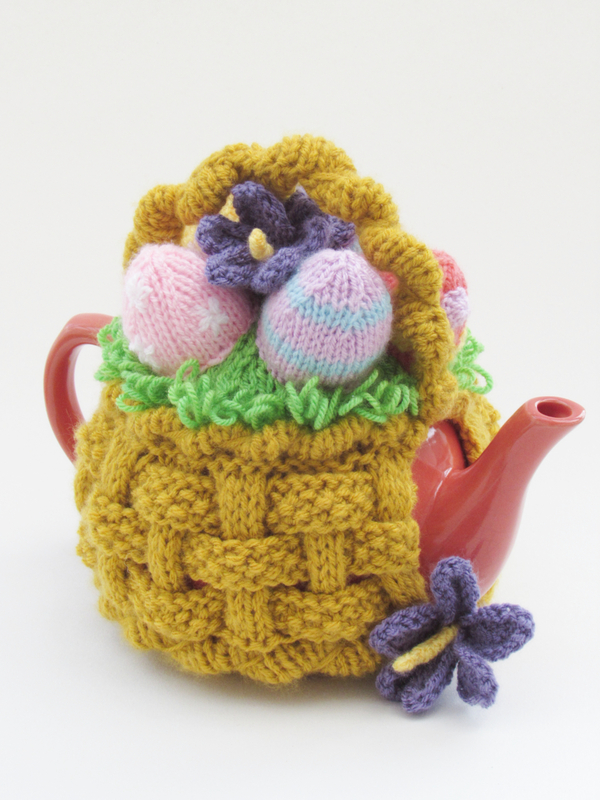 The Basket of Easter Eggs tea cosy is an exciting Easter tea cosy that is full of springtime fun. 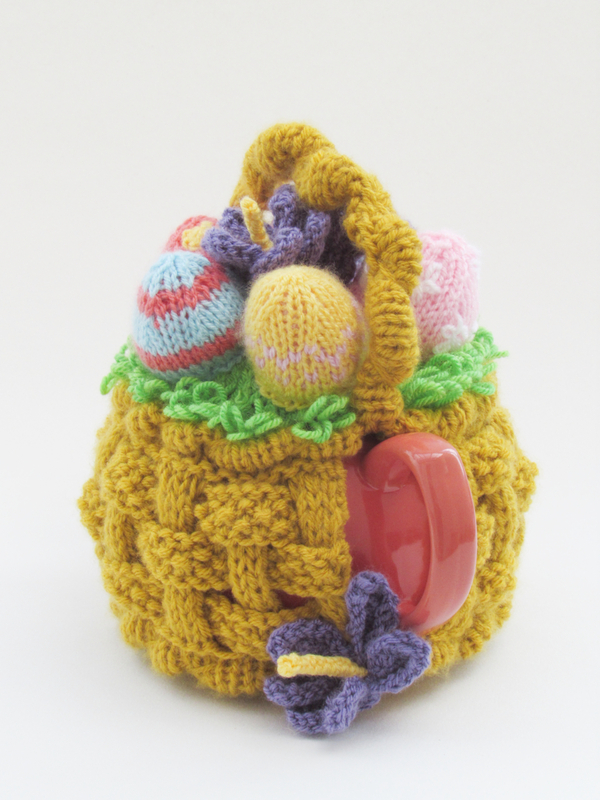 The cosy was inspired by painted Easter eggs and Easter egg hunts, and the little basket makes me think of the Easter bunny hopping around with his basket of eggs to hide. 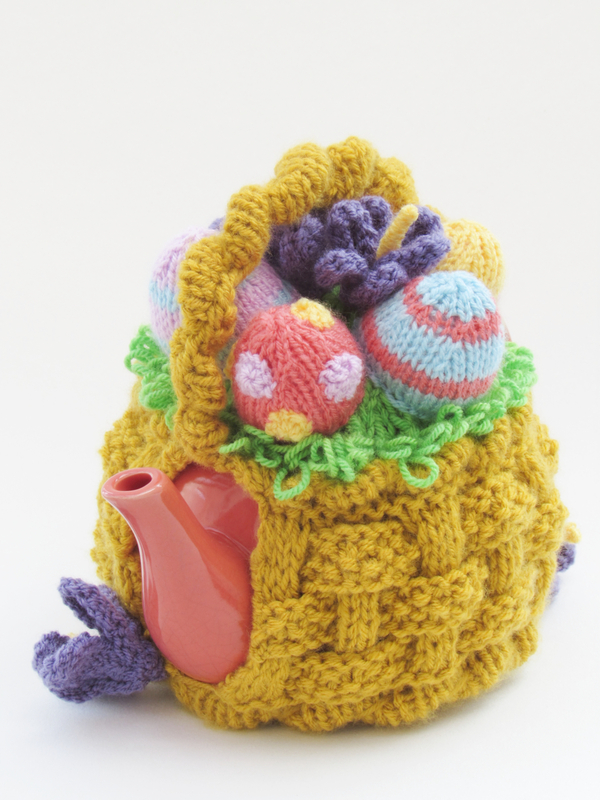 The Easter basket has five painted eggs inside, with assorted designs and colours. 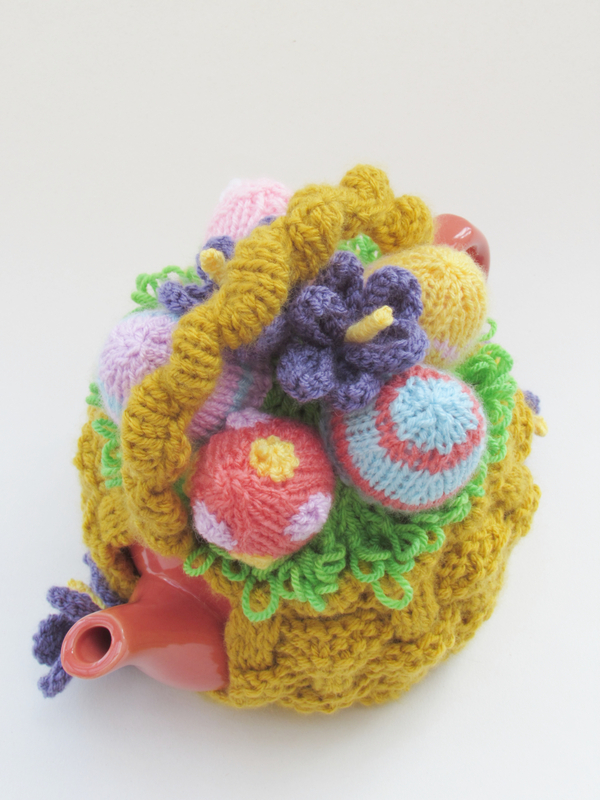 And there are four dark purple crocus flowers in and around the basket. 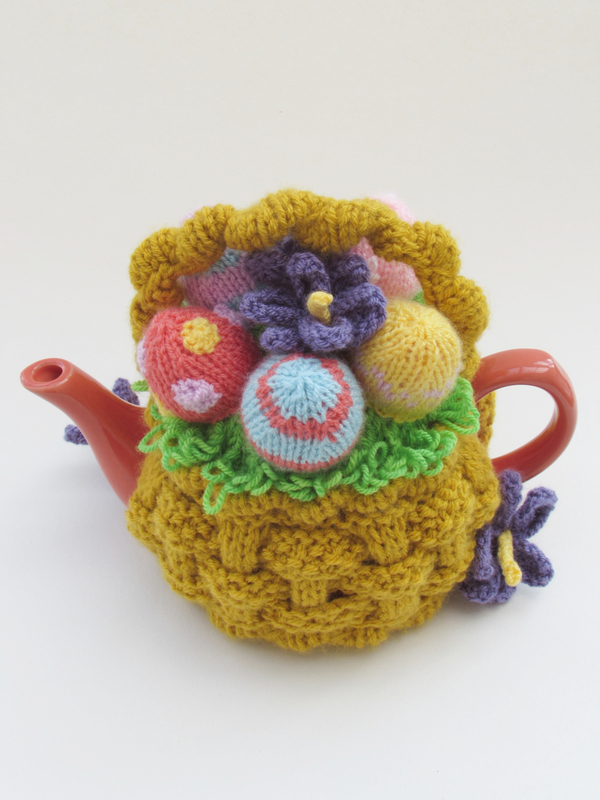 For the knitter there are lots of interesting elements in this project. 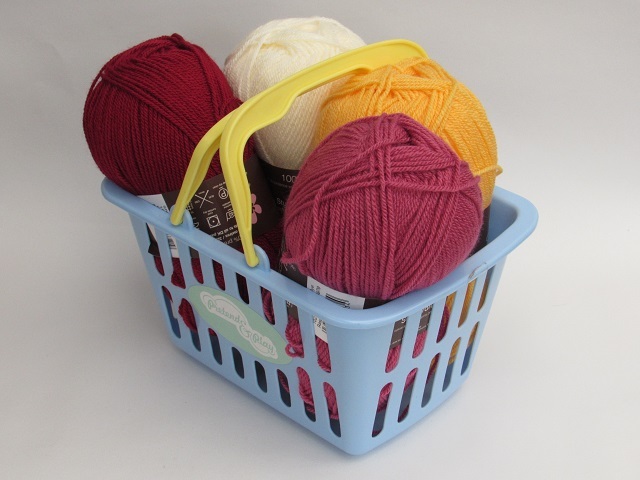 There are mock cables around the bottom edge and rim of the basket. 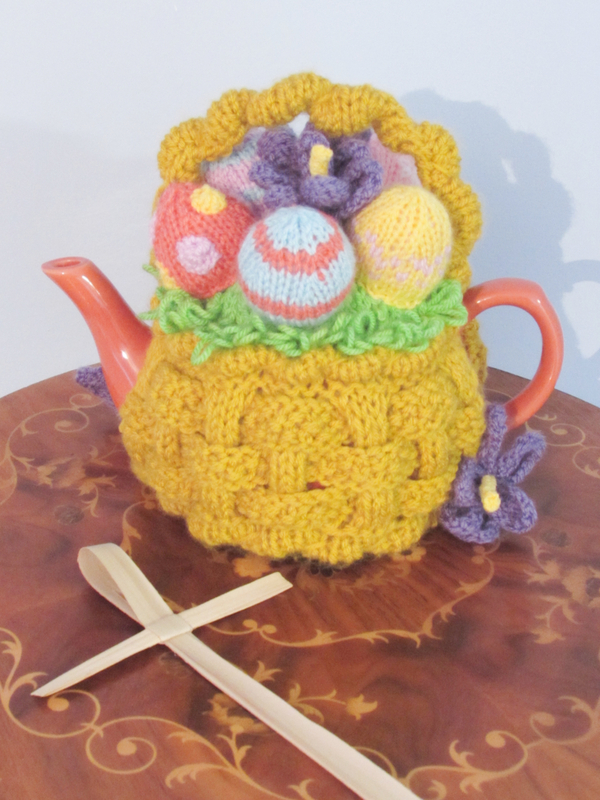 The basket itself is actually woven knitting. 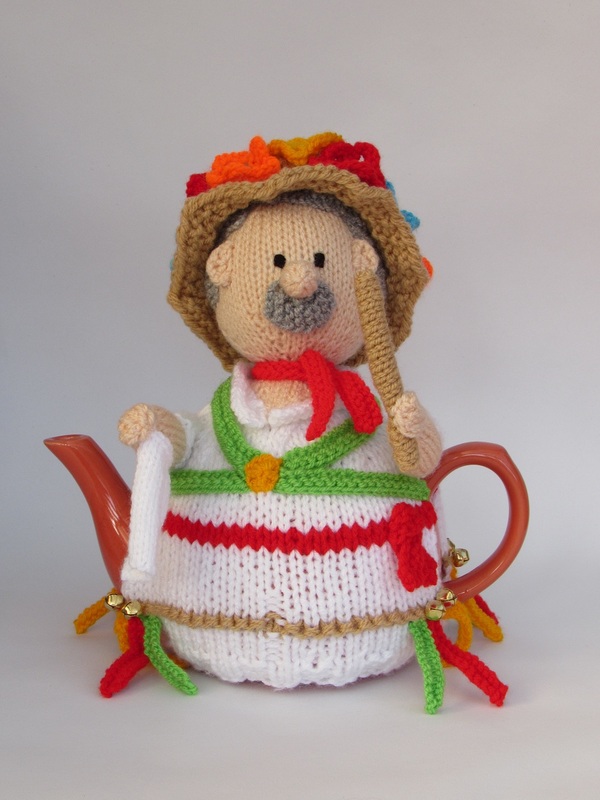 Then the grassy lining in the basket is knitted in loopy stitch. 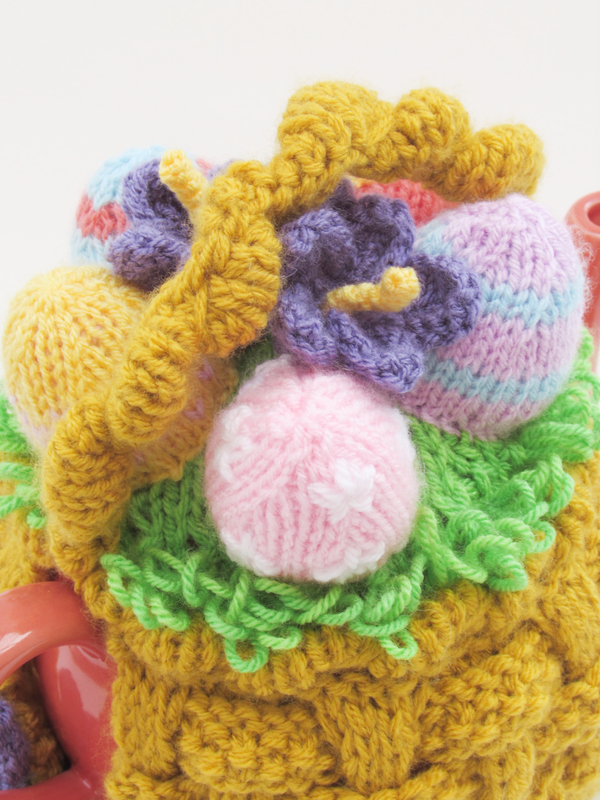 The eggs have color change, intarsia and applique work on them, but you could knit plain eggs or use colour changing yarn to give your eggs stripes without the hassle of changing yarns. 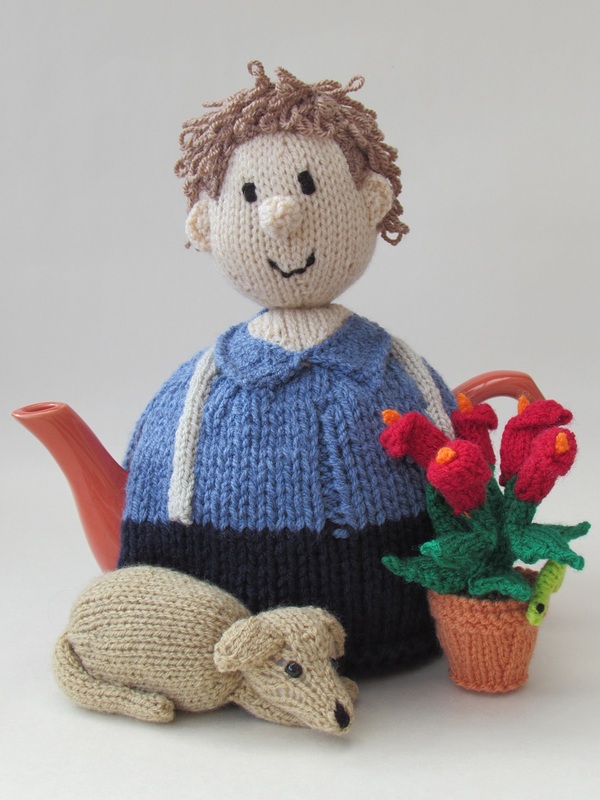 The knitting pattern contains lots of photos to help and guide you. 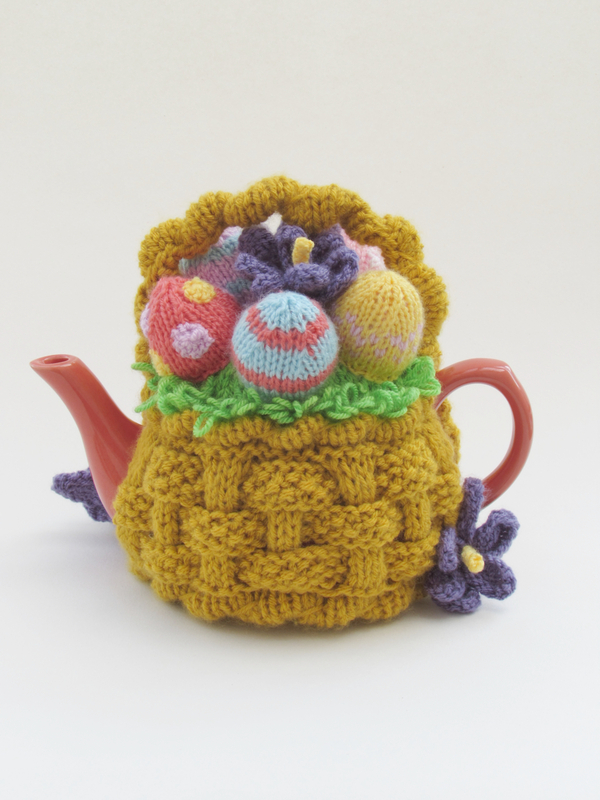 The basket of Easter eggs tea cosy is certainly a great tea cosy for stash busting because the painted Easter eggs can be worked in any colours. 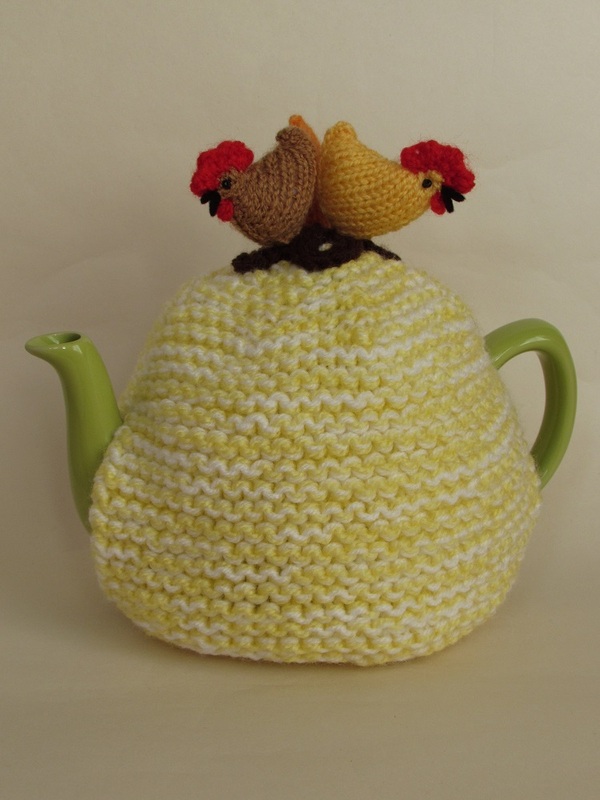 This is a great Easter tea cosy, and feels very springtime. 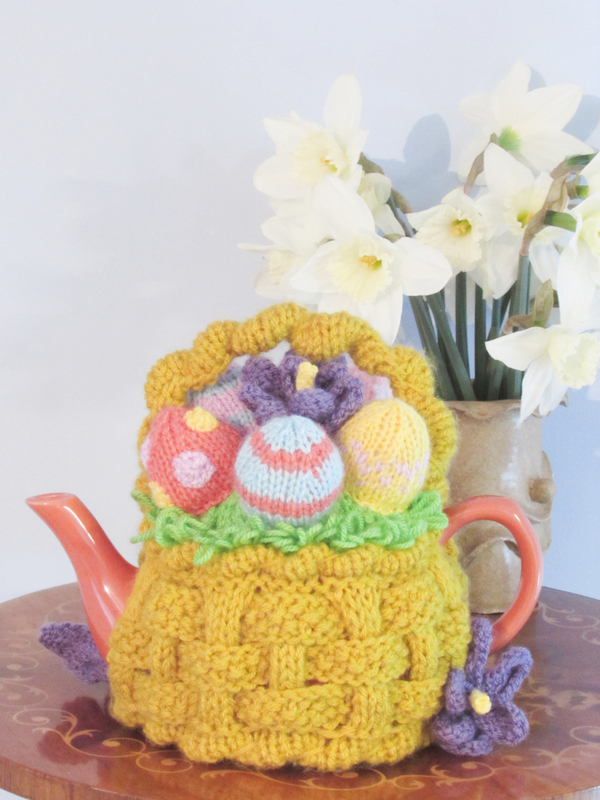 But if you don't care for the Pagan symbols of Easter eggs, you could make a Basket of Crocus tea cosy, and knit a dozen crocus in purples, yellow and white and it would look stunning. 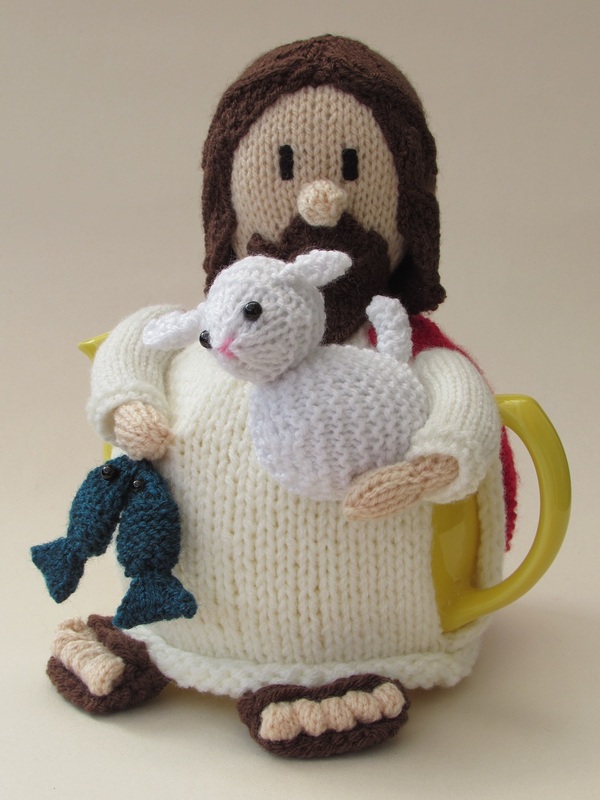 Please Note: If you are buying the ready knitted tea cosy, the colour of the eggs in the basket my vary.